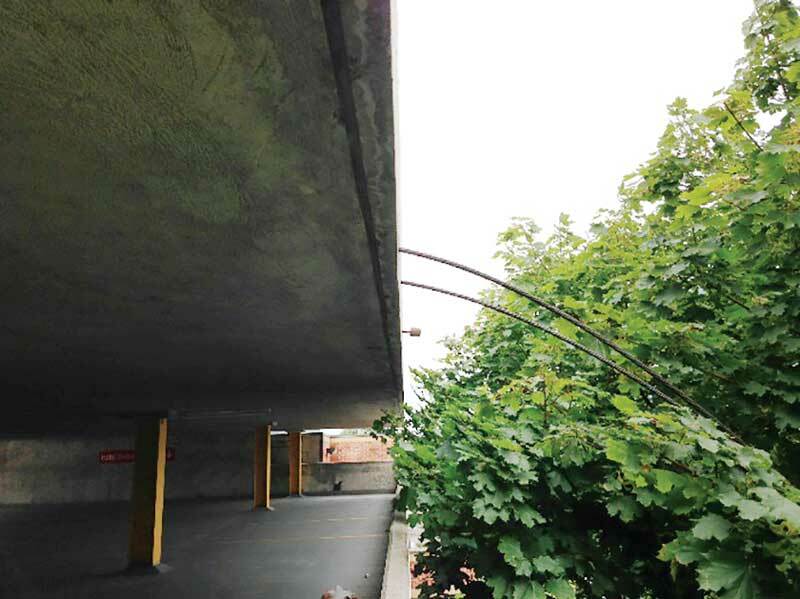 While conventionally reinforced, concrete structures typically exhibit visible and obvious warning signs as they weaken, deterioration of post-tensioned structures often remains concealed, delaying corrective action. This deterioration can lead to individual post-tensioning strands failing (i.e. strands losing tension—similar to a stretched elastic band breaking), which instantaneously reduces the structure’s load-carrying capacity. Worse, the result of a strand failure is unpredictable. While the issue often remains concealed within the structure, strands can also be ejected from the concrete floor slab (Figure 1). While the former scenario can result in unsafe conditions—where a structure’s load-carrying capacity is compromised without the knowledge of building owners and occupants—the latter can have serious consequences, such as property damage, personal injury, and the perception of a structurally unsafe building (which may or may not be true). Appropriately timed condition evaluations are critical in ensuring the safety of post-tensioned structures. These assessments help engineers and building owners determine the risk of strand failure, allowing them to predict the rate of deterioration, plan, and budget for maintenance and capital repairs, and develop an overall strategy for managing the post-tensioned system over the structure’s service life. This knowledge allows for early implementation of measures that can mitigate deterioration, reduce safety risks, and limit or defer repairs—saving building owners significant cost/disruption and reducing liability. Regular review and documentation of the post-tensioned system’s condition can also enhance property value, providing prospective tenants and purchasers the confidence they are investing in a sound, well-managed structure. Post-tensioning is a form of prestressed concrete in which high-strength steel strands are cast into a concrete slab or beam and tensioned to a high degree of stress following curing. The tensioned strands are anchored at either end, resulting in compression of the concrete between the anchor points. Pre-compressing the concrete reduces the material’s inherent weakness in tension, allowing for lighter structures, thinner slabs, reduced deflections, and longer spans when compared to conventionally reinforced concrete. Post-tensioning can be bonded or unbonded. The former, most often used in bridge construction, is pressure-grouted following tensioning, which acts to bond the steel in place. 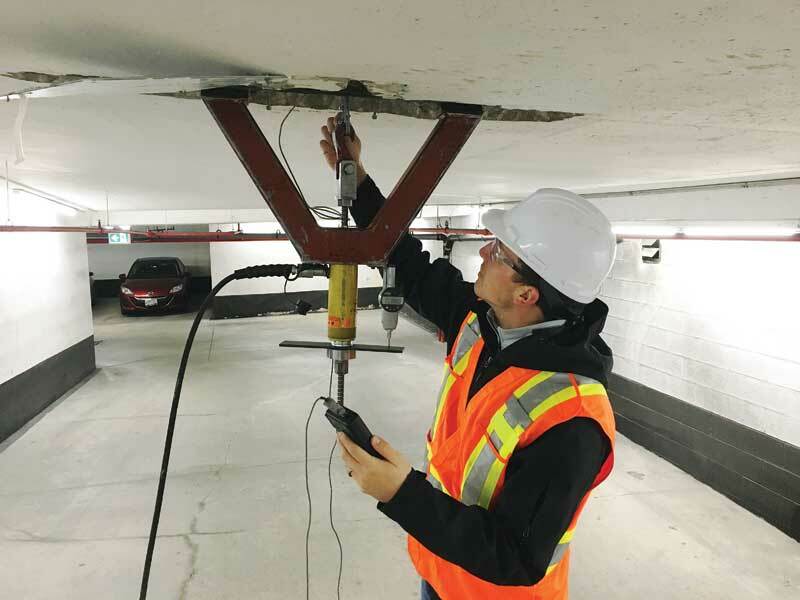 Unbonded post-tensioning (commonly used in the construction of buildings and parking structures) remains separated from the surrounding concrete except where the load is transferred at the anchors. This unbonded system is the focus of this article. concrete, which surrounds the post-tensioning reinforcement and forms the main structural element and surface that supports loads. The complete assembly of the steel strand, grease, sheathing, and anchorages is referred to as a post-tensioned tendon. Each steel strand typically has its own sheathing and is referred to as a mono-strand. First patented in the 1800s by P.H. Jackson in San Francisco, post-tensioning was refined to its contemporary form in the late 1920s by Eugene Freyssinet in France, gaining popularity in North America in the 1960s. 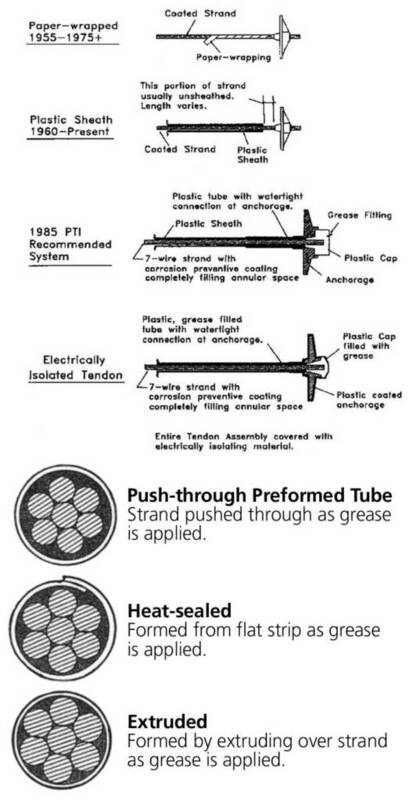 As with all construction technology, post-tensioning evolved as those working in the industry learned from past failures and technological advancements improved durability (Figure 3). The first system consisted of a greased strand wrapped in paper. The paper-wrap provided little protection against moisture and chloride ingress and was eventually replaced with an impermeable plastic sheathing. The initial forms of plastic-sheathed tendons were fabricated by wrapping a flat piece of plastic around the greased strands and sealing the overlapping length (referred to as “heat-sealed” or “cigarette” systems). 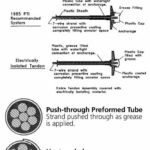 Alternatively, the greased strands were pushed through the preformed sheathing (referred to as “stuffed” or “push-through” systems). In both these configurations, the sheathing diameter was larger than the strand, allowing for potential air voids and creating a direct path for moisture and oxygen to access the steel strand and drive corrosion. Additionally, the sheathing was often cut short at the ends to facilitate anchorage installation, which provided an access point for moisture and left the strand ends vulnerable to corrosion. These weaknesses were addressed in 1985 when the Post-tensioning Institute (PTI) introduced Specifications for Un-bonded Single Strand Tendons, which required a tightly fitted extruded plastic sheathing. 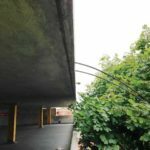 In the years since, post-tensioned systems have been further improved with the introduction of encapsulated anchorages wrapped in a protective coating, resulting in a system completely isolated from the surrounding concrete. 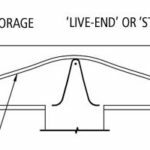 It is important to understand the age and type of post-tensioning system installed in a given structure, as this plays a significant role in the deterioration risk and scope of evaluation.